How to secure your windows – for the urban city cat! I am constantly amazed at how many people I see who keep their windows shut tight during the summer because they are nervous of their in-door cat escaping or falling out of the window, especially people who live in flats higher than the first floor. I stumbled upon Dominic Parker during one of my internet searches for cat enclosures and thought he had come up with the perfect solution. 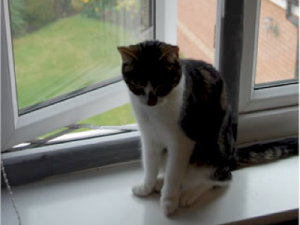 Click HERE to view a video of flat cats – window protection for cats. It really is the best solution I have found so far. No more stuffy flats! Open windows here we come.